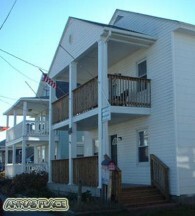 Annas Place Apartments are located on 7th Street only one short block to the beach. Each Apartment sleeps 6-12 people. Come and feel the pure joy of breaking far away to enjoy the freedom of the beach. Let the constant rumble of waves relax you while chill in' out under a big beach umbrella. Ocean City and Annas Place Apartments are waiting with open arms and open beaches to help your group make some memories at the beach to keep for a lifetime.